Big pool, two houses. Hot tub will go here. Upstairs bedroom will have a brand new queen. This BR will have a queen plus two twins. Patio with plenty of seating has view of pool house. 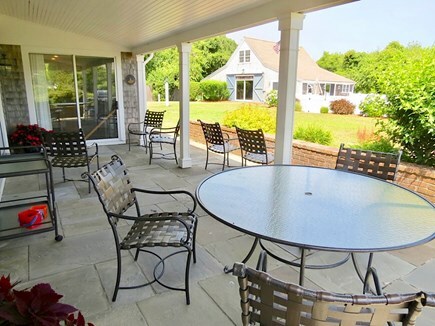 If you relish the charm of Chatham but love modern amenities, here’s the resort style vacation destination for your larger group. The acre-plus property provides two separate structures with sleeping for up to 14. 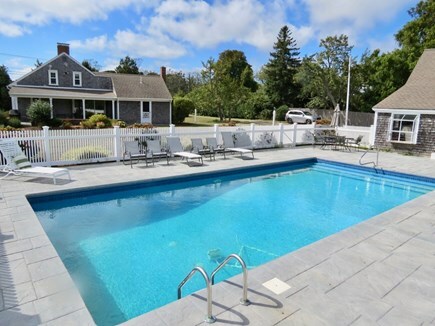 The in-ground heated pool is the focus of summer outdoor living here, further embellished by the new heated spa. The property’s location is ideal. You can walk or bike to the restaurants, shops and entertainment unique to Chatham Village. Or slip into your swimsuit, grab a towel and head to nearby Oyster Pond Beach or famous Lighthouse Beach, your choice. Each less than a 15-minute walk. The larger main house features a big covered outdoor patio with a dining table, plenty of seating and a gas grill. The patio overlooks the pool house and pool less than 100 feet away. The pool house adjoins the surprisingly large pool, surrounded by a roomy stone deck with a dining table, plenty of lounge and other seating, an outdoor shower and, of course, the tempting new spa. 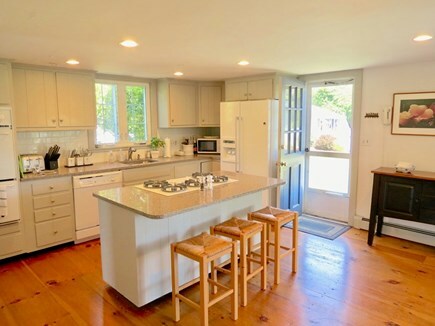 Inside the main house, you’ll be delighted by the fully outfitted, renovated kitchen with granite counters and a center island with built-in gas range top. The kitchen walks out to the patio for convenient serving when you dine outside. 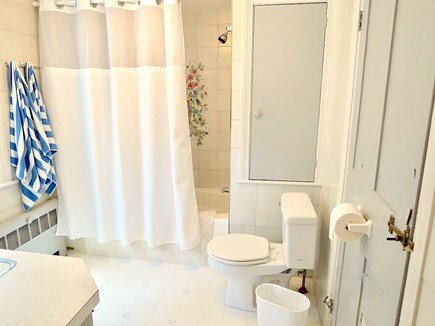 You’ll also find a handy half bath just off the kitchen. There’s a good sized dining room with a patio view. 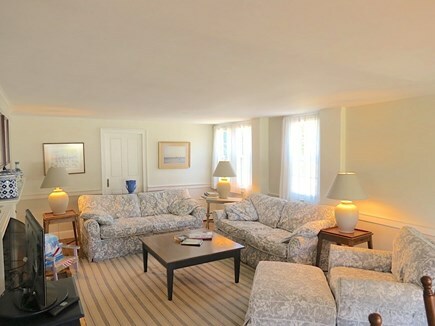 The large, comfortable living room adjoins the dining room and offers a flat screen TV. The main level also has a small den/office with a another TV seating area for the kids to watch shows/movies. 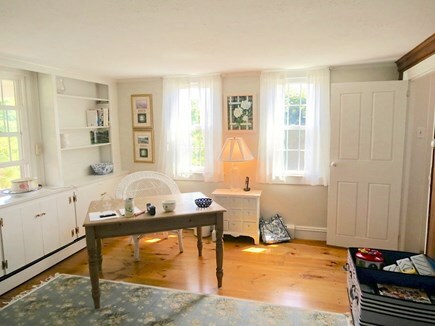 The home has high speed WiFi, a SONOS system, and is centrally air conditioned. 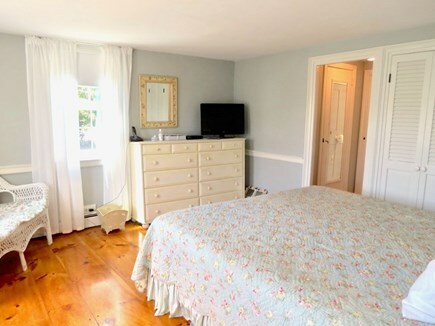 The master bedroom suite is also on the main level and includes a big king size bed and full bath en suite, which has a tub/shower combination. The master also has a flat screen TV. 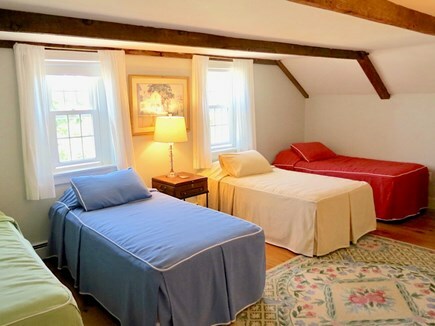 On the upper level of the main house, there are two bedrooms, one with a queen size bed and a pair of comfy twins. The other bedroom has twins. 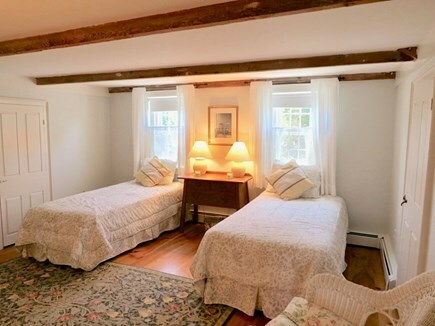 These two bedrooms share a roomy full bath. 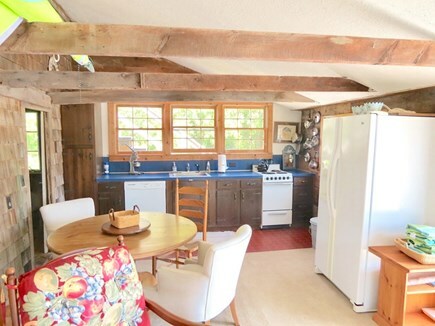 The pool house offers rustic, lodge-like charm with exposed beams and vaulted ceiling in the full kitchen and adjoining family room/TV lounge. 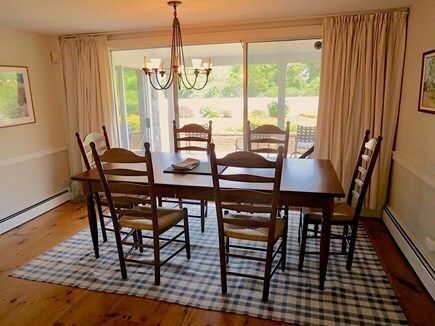 The kitchen is fully equipped and includes a round dining table and chairs. 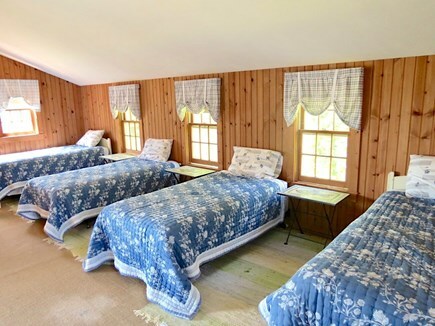 The pool house has a main level bunk room with four twins. There is also a ping pong table on the main level. 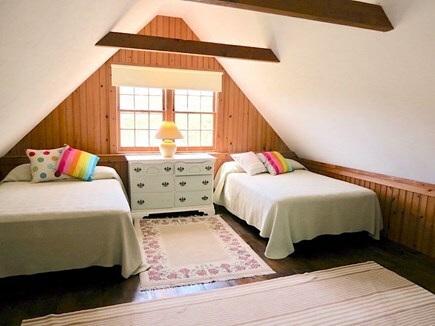 The upstairs sleeping area has another pair of twins plus a step-up section with a comfortable queen bed. That upper level walks out to a spacious second level deck overlooking a natural vista of undeveloped woodlands. Please click on the Rates tab for detailed information about weekly rates. 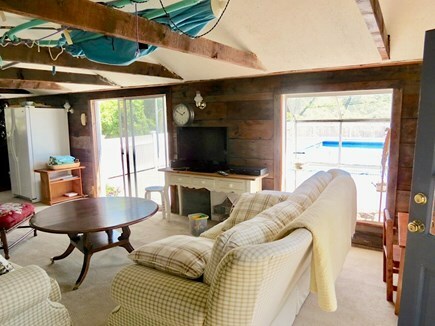 This property has a seven-night minimum during the peak season. As is customary in vacation rentals there are additional fees to the rates listed. Those fees include $115 reservation fee and an $80 non-refundable Accidental Damage Protection (ADP) fee. In addition, there are state and local taxes applied to all reservations less than 31 days in length that total 12.45%.